PIN: Password: Remember me Forget Your Password? Enter the email address of your account to have your password sent to you: To return to the login form, press the cancel button. Applying HACCP Principles™ For The Food Service Industry has been Reviewed and Accredited by the HACCP Alliance as meeting the required standards for content and training for introductory HACCP. Enroll in the HACCP Training course for managers here and start training online right away. Recognized by the ACF for 10.5 CEU hours. How to identify critical safety issues involved in handling, preparing and serving safe food. How to develop record keeping and verification methods to implement and maintain a HACCP guideline plan. Still have Questions? See below or contact us. An Interactive Learning Environment is a group of educational computer software programs where the participants take part in their learning interactions either with or through the computer over the Internet. Some interactions are between the learner and the software on the website (Such as interactive quizzes and videos), while other interactions may be in the form of instructor-led classroom-like group forums. While this all sounds complicated- it's easy to use and friendly. All of the courses are delivered through our members-only Interactive Learning Environment. The courses, designed to be self paced, are formally structured. Try the sample lesson above. Relax, you may set your own pace. The system will remember the last chapter you completed and start you there the next time you login. Yes, you may access your HACCP learning environment from any computer with an active Internet connection and web browser. Please be aware that logins must not be shared among individuals. Each person taking the course needs an individual login. We accept major credit cards. You may also pay by check or for some corporate accounts we may accept your Purchase Order. Please call our toll free number to get your username and password to access the course(s) as well as make arrangements for payment. There is no expiry to access the course. You may access the course until completion. Likely yes, depending on your needs we may customize online course content or create new courses to suit your applications. Call us for details. HACCP for retail and food establishments as adopted by the US FDA. HACCP began as one of many voluntary food safety codes and recommendations established by the Codex Alimentarius Commision of the Food and Agriculture Origanization (FAO/WHO) of the United Nations. HACCP training is recognized as the most efficient way to ensure the safety of food products. This course follows the classic approach to Hazard Analysis Critical Control Point (HACCP) and covers the scientific basis and methodology of HACCP. When you complete our HACCP Online Course you will receive a Certificate of completion with the official seal of the International HACCP Alliance. 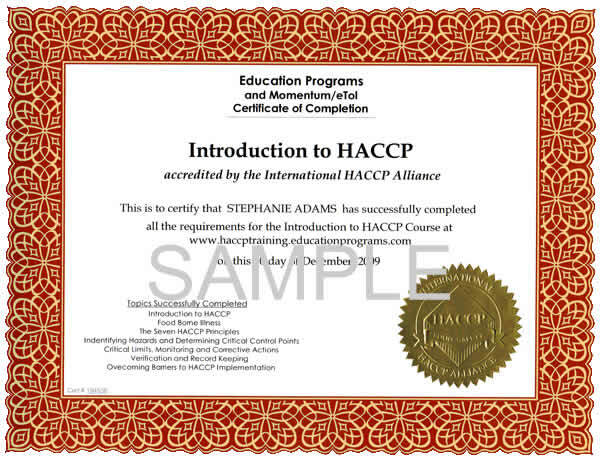 Be certain any course you consider taking will issue a certificate the internationally recognized HACCP Alliance seal. HACCP is recognized as the most efficient way to ensure the safety of food products. HACCP Training from Education Programs will ensure your ability to provide due diligence for food safety principles in your establishment.